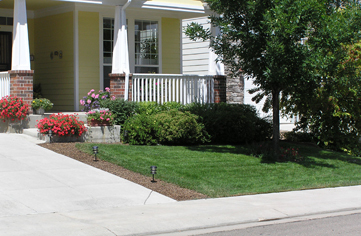 All-Pro Lawns was established in 2002 as a full-service lawn maintenance and landscape contractor serving the Boulder County area. Our primary focus is on lawn maintenance, landscape installation and renovation and commercial snow removal. We offer complete lawn care, including aeration, fertilization, cleanup and pruning. All-Pro Lawns is fully-insured and licensed. The mission of our company is to provide high quality and personalized service in lawn and landscape management. We serve residential, commercial and home owner association properties. Whether maintaining your lawn or renovating your entire landscape, we will take the time and care needed to help add the curb appeal that your home or business deserves and that you have come to expect. We provide a courteous and conscientious staff that is well trained, experienced and highly professional. Since we provide a regular service at your property, we strive to schedule the same uniformed crew each week. This will ensure that our staff becomes familiar with you and your lawn. As a family-owned and operated company, we take pride in developing long term and personable working relationships. In return, many of our customers are happy to refer neighbors and friends. © 2011 All-Pro Lawns, Inc, all rights reserved.